Energy Suspension Sway Bar End Links Universal Fixed Length 1-5/8"
Prothane 19-405-BL - End Link Bushing Set 3-1/4"
Energy Suspension 9-8123G - Sway Bar End Links Universal Fixed Length 2"
Energy Suspension 9-8123R - Sway Bar End Links Universal Fixed Length 2"
Energy Suspension 9-8163G - Adjust-A-Link End Links 3-3/8" to 3-7/8"
Energy Suspension 9-8163R - Adjust-A-Link End Links 3-3/8" to 3-7/8"
Sway bar end links are a very critical part of your suspension system so strength and precision are mandatory if you want to control body roll and cornering stability. Factory end links are designed with rubber bushings to reduce vibration but they fail to reliably control body roll. 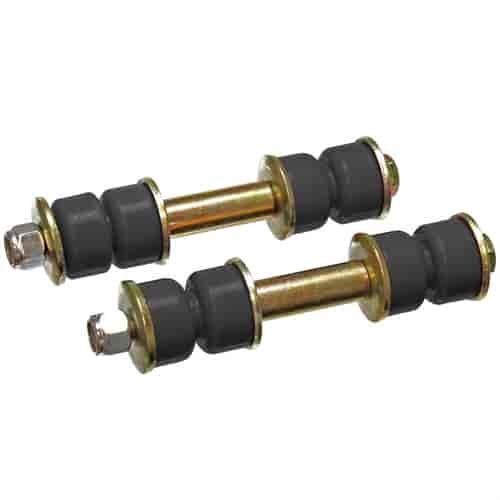 By using Energy Suspension polyurethane end links, you can reduce deflection over factory rubber bushings, and dampen felt vibration better than solid bushings. These features make Energy Suspension sway bar end links the perfect choice for street or track use. Does Energy Suspension 9-8120G fit your vehicle?